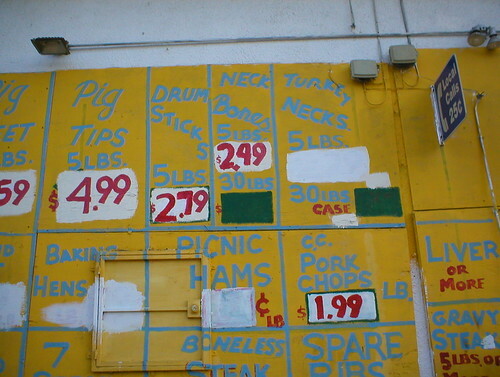 “Pig Tips, Etc.,” originally uploaded by R. Walker. The first pictures in the MLK BLVD pool were, of course, things that I put there. 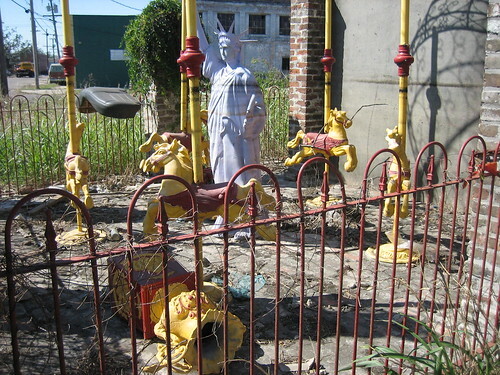 Pictures I had taken in New Orleans, back in 2003 — well before Katrina, that is. More shots of mine from N.O., before Katrina, and after, follow the jump. “MLK BLVD,” originally uploaded by R. Walker. “Lakeside of Claiborne (2),” originally uploaded by R. Walker. The shots above are also from 2003. Those below are from a return visit to New Olreans (we had moved away prior to Katrina) in October 2005, about five weeks after the hurricane. 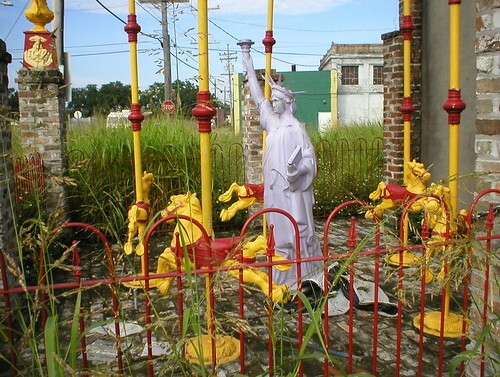 “MLK Blvd., New Orleans (Post-Katrina),” originally uploaded by R. Walker. 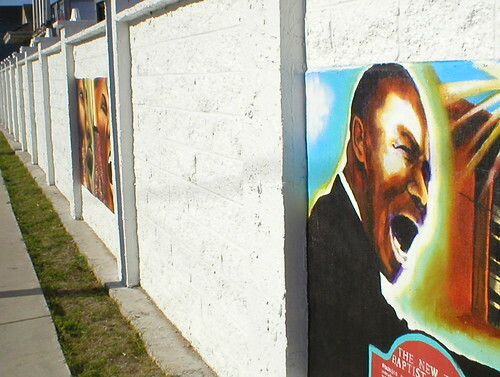 Here’s an odd MLK scene that I photographed in 2003, then in 2005. The horizontal markings around Lady Liberty’s shoulders indicate the flood-water line. 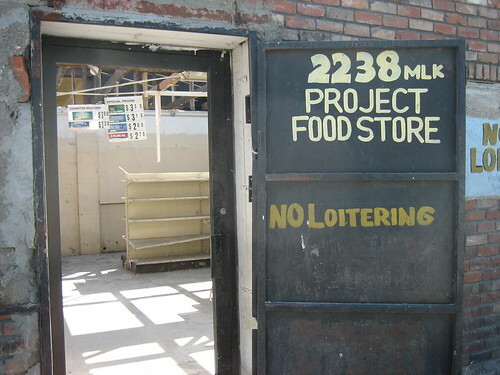 “Project Food Store (Post-Katrina),” originally uploaded by R. Walker. Also from the October 2005 visit to New Orleans: I had taken a picture or two of the Project Food Store in 2003, when it was still intact and in business. (The name presumably had to do with the fact that it was right across the street from a housing project.) I don’t know how much of the damage here is storm related, but it would appear that this store is out of business for good. “Calliope (Post-Katrina),” originally uploaded by R. Walker. 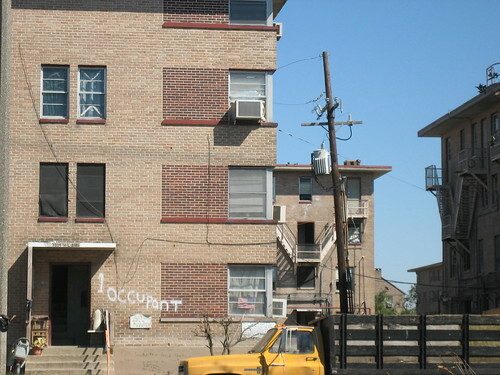 An October 2005 image of the Calliope housing project (where Master P is from). Hardly anyone was around. I did see another guy taking pictures outside Calliope. This entry was posted in New Orleans, LA. Bookmark the permalink.